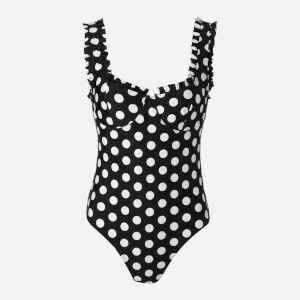 Women's tri-colour striped swimsuit from New York swimwear label, Solid & Striped. Crafted from stretch lurex fabric with subtle metallic shimmer, 'The Michelle' one-piece showcases a plunging V-neckline, a low back and a high-cut leg for a flattering silhouette. Complete with a full lining and tonal zigzag stitch detail throughout. Shell: 73.9% Polyamide, 13.2% Polyester, 12.9% Elastane. Lining: 88% Polyamide, 12% Elastane.